The SASE gGmbH, a not-for-profit organization, studies and conveys the knowledge about waste processing and its management. In its context the SASE - as an exhibition dealing with city cleaning and waste management - is a globally unique institution. For visitors the permanent exhibition "Meine Stadt soll sauber sein" (my city shall be clean) is more than just a collection of waste related exhibits, but an experience that enables them to connect to the vast field of urban environment protection and it highlights the importance of this sector for each and every one of us. Two halls of 1,800 m2 exhibition area and 8,000 m2 of open air space are utilized to present the collection of vehicles, consisting of garbage trucks as well as specialized vehicles of the city cleaning organization. A restaged medieval household and the world’s largest collection of waste containers illustrate the evolution starting with the organized ash pickup leading to the innovative and environment friendly waste processing and recycling techniques. Open for experts, as well as the public, the SASE offers a great opportunity for networking and cooperation of companies, experts from the public sector, politics and research institutions. Schools and other education institutions as well as national and international visitor groups can utilize the vast space for training and environmental education. Furthermore, the facilities are a unique location for conferences, symposiums and seminars, especially with relation to the waste management industry. Understanding the problems and solutions of the past in order to be better prepared for the challenges of the future - that’s the intention of the SASE. Without organized and innovative city cleaning and garbage processing a modern and urban society would not be possible. They are a necessity due to hygienic and health as well as aestheticrequirements. To highlight this, the SASE exhibition is describing the urban situation in the past and deep dives into future scenarios. Waste management in a modern sense only evolved about 150 years ago! Especially the last decades have revealed vast developments in technologies, fields of application and organizations. Such evolutionary developments have – outside of SASE - never been studied and made publicly available. History-Marketing resulted from the increased competition in the more and more interlinked and globalized markets. The concept highlights the own company history as an asset in marketing which can be monetized during the diversification into new markets. The investigation and communication of the own history with its tradition, stories of development and sustainability is seen as a positive attribute and can improve the perceived brand recognition as well as company and sector value. In addition hasthe reassessment of the company history have a positive impact on the trustful relationship with customers, employees and other stakeholders. While other comparable sectors have established their company museums and exhibitions, this has not been the case in the waste management industry. This is where history marketing comes into place. It includes guided company tours, speeches, publications, deep dive information material, public display of technologies and similar activities. The showcased evolutionary developments and the presentation of successful products and solutions of the German city cleaning and waste management branches offers a holistic overview of the sector. The technical collection represents history marketing as “the memory of the industry”. Besides the impact on perceived brand awareness it also allows interested individuals to study the sector’s history first hand. In comparable industries with SME dominance, this asset is often only kept in the heads of the older employees and if leveraged, only and utilized internally. In the waste management industry, many solutions and innovations are a direct result of collaboration of stakeholders on different value chain levels which makes it necessary to share and build up on these assets of knowledge. This is the only valid strategy to sustain the high quality standards and to develop new and innovative solutions in the future. 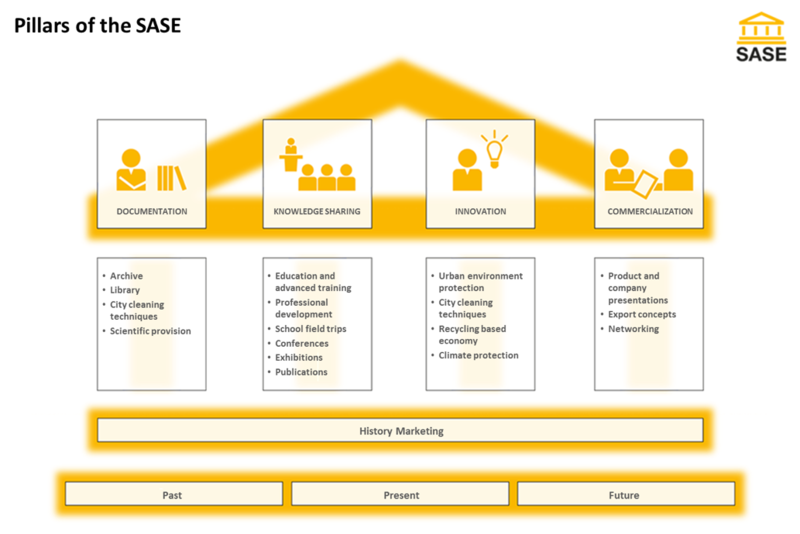 This concept allows for a holistic assessment of the industry’s situation and a joint development of a highly interlinked and dependent industry. Utilizing this channel, history-marketing provides the basis for the competitiveness of the sector and the power to innovate in the future.